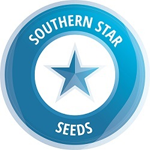 Southern Star Seeds is the result of many years of breeding and constant testing. For the last 25 years, it has been a passion that shows no sign of letting up anytime soon. The desire to create and improve Cannabis genetics and produce exceptional varieties is the biggest motivator. The commitment to ensuring the highest quality work is done during breeding is reflected best in the strains desirable attributes and their suitability for many ailments. Southern Star Seeds loves Cannabis. Cannabis truly is a remarkable plant with a wealth of uses that mankind is only now starting to realize. All stains are created to ensure genetic uniformity. Viability tests are carried out regularly to ensure an estimated germination rate of 90%-100%. Yields of each strain available are subject to the conditions under which they are grown, but a focus has been made on developing high yielding genetic varieties.